Liens against real estate developer pile up halting condo progress in Las Vegas. Economic downturn and improper construction has stopped construction on this $350 million ManhattanWest Las Vegas mid rise real estate development. Problems arose for ManhattanWest last August. During this time the general contractor Camco Pacific replaced Apco Construction. 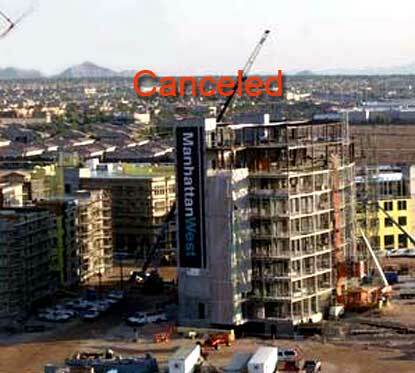 Manhattan West Las Vegas condos stopped construction on development in west Las Vegas real estate. The mid rise development by Gemstone Development cites mortgage lenders terminating financing. The local real estate developer is looking to create an investment group for buying discounted senior notes for completion of the development. 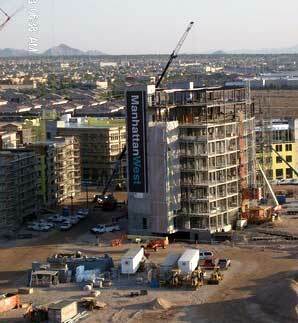 Manhattan West condos for sale in Las Vegas, Nevada real estate topped off Element House. Element House is the nine story flagship building within the southwest development of Manhattan West. It is located off of the I 215 and Russell. Gemstone Development is continuing construction progress while others in the Las Vegas real estate market have either halted or stopped their projects due to the falling credit market and current economic conditions including Trump Towers Las Vegas, Plaza, Crown Las Vegas and Echelon on the Strip. Manhattan West Las Vegas condos is a 20 acre, $350 million development in southwest Las Vegas real estate near Sullivan Square condos. The plans are for the 700 mid rise condos in a mixed use environment with retail and commercial office space.